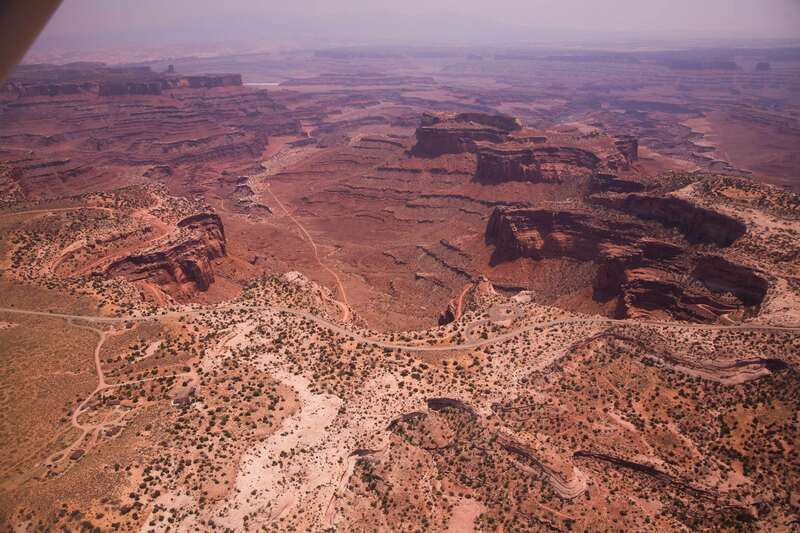 Aerial view of Upheaval Dome, Utah. Credit: Michael Steinbacher. Salt dome, meteor impact, or neither? In several previous Pictures of the Day, the catastrophic nature of geological formations around the world were compared to the conventional analysis based on gradual processes of erosion, uplift, and faulting. In nearly every case, the slow formation hypothesis was found wanting. In particular, structures in the American Southwest exhibit signs that they could have been created in an amazingly short time. The stone escarpments have vertical sidewalls, flat tops, and valleys wide and deep between them. Where there are peaks they are often sharp, with many spiky protuberances sticking up from their summits. These spikes are sometimes exotically shaped, looking like stacks of fused boulders or a thicket of pillars. There are often multiple, alternating layers of rock that have been sculpted in regular, repetitive patterns covering thousands of square kilometers. Erosion through wind and water is a chaotic process because the movement of air and water molecules aren't predictable. It is certainly the case that erosion has and is taking place everywhere in the world. However, erosion causes blurring and softening of the landscape, by no means does it cut like a knife, or excavate like a posthole digger. 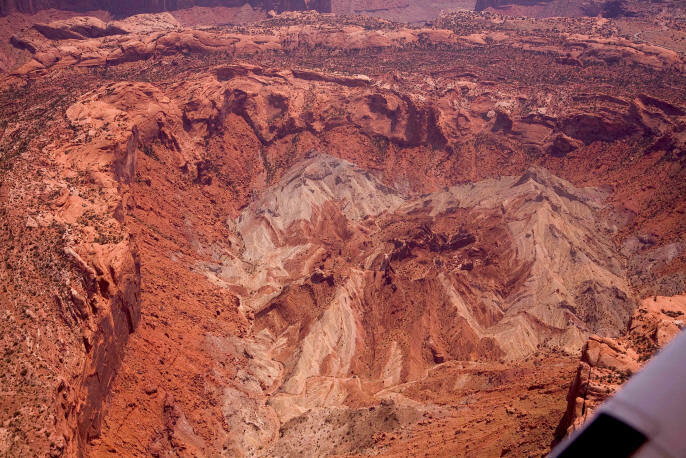 Upheaval Dome is one such geographical formation that is difficult to account for with standard theories. It is more than two kilometers wide from rim to rim and is nearly half a kilometer deep. 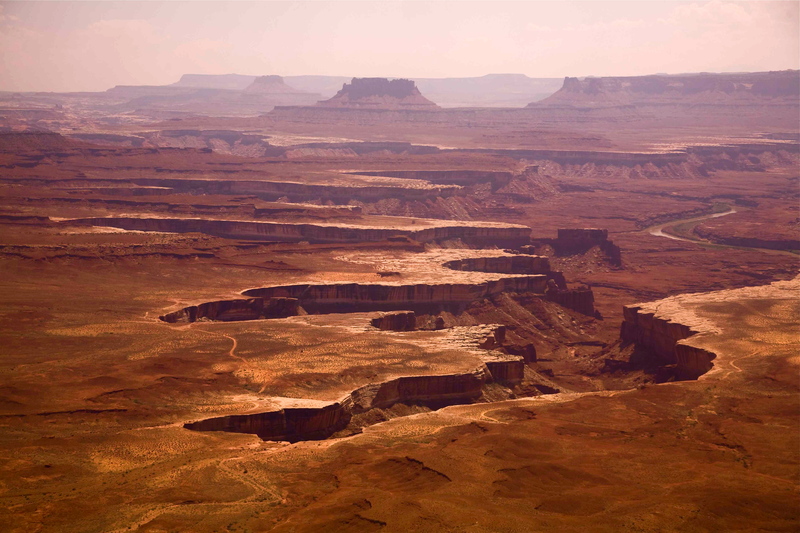 It was once thought to be a collapsed salt dome because there are many salt domes in the Canyonlands National Park region. According to the theory, a vast inland sea once covered the central portion of the United States approximately 300 million years ago. As time passed, the sea evaporated, leaving the dissolved salts behind in a thick crust. Over millions of years sediments were deposited that subsequently compressed into thick layers of rock—sandstone layers in the case of Upheaval Dome. The weight of the overburden gradually pushed the salt deeper into the earth. 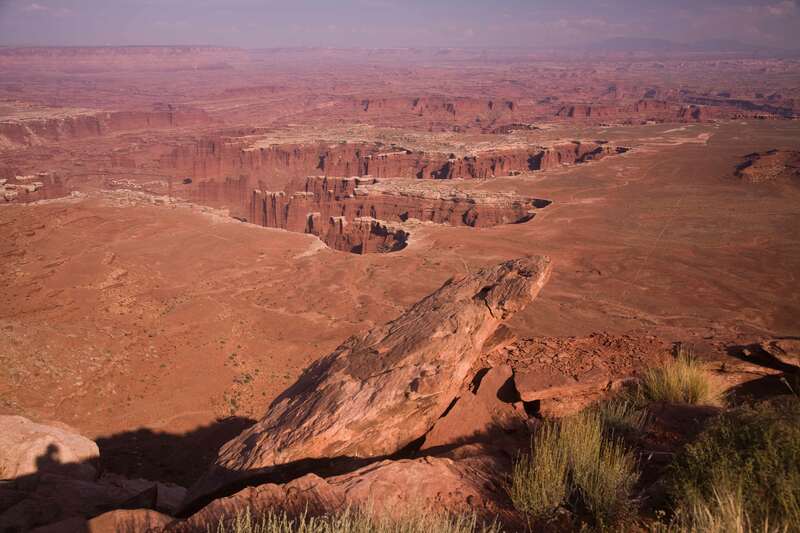 Since salt is not as dense as sandstone, the pressure caused it to become buoyant, whereupon it rose through weaker layers until it pushed, or "heaved" the overlying strata into a dome. As the sandstone eroded, it uncovered the salt and exposed it to the same corroding effects that, over more millions of years bored into the easily dissolved mineral, causing it to collapse from within. 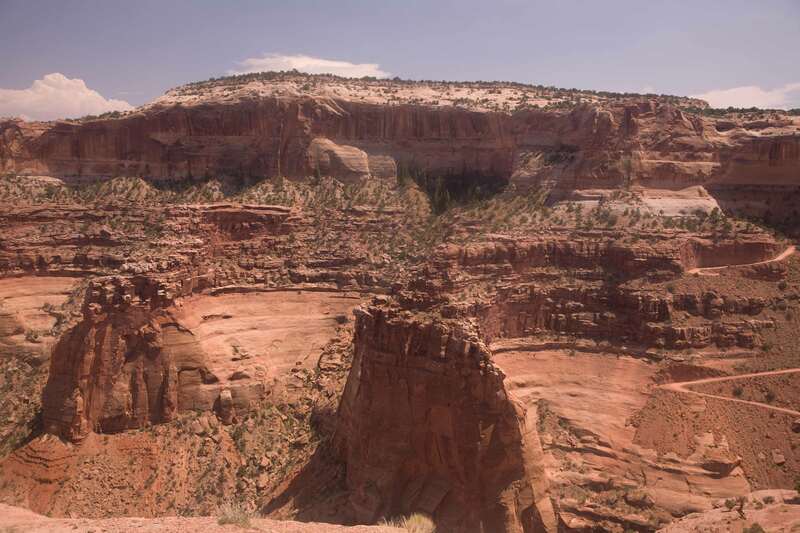 However, there is no definitive evidence that an accumulation of salt exists beneath Upheaval Dome. 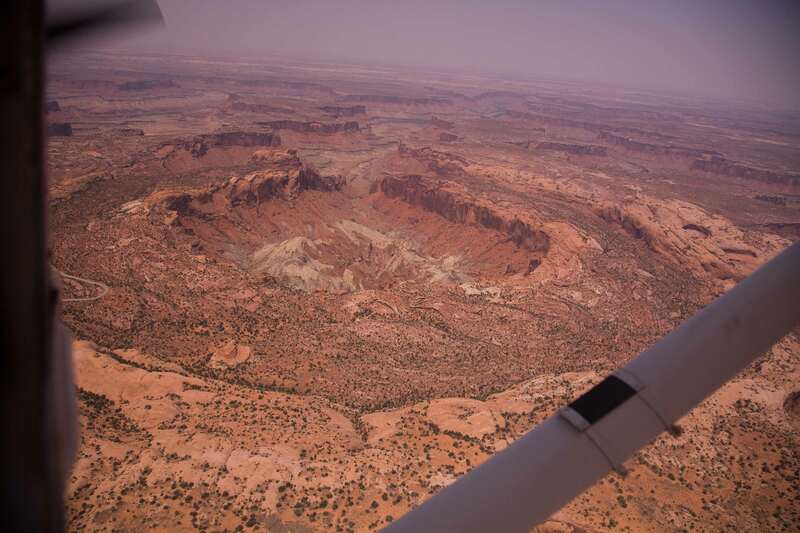 Recently, another theory has suggested that the Dome was formed in a so-called "rebound" event when a meteor crashed to Earth 60 million years ago. The original impactor is long gone because of weathering, but the appearance of shattercones discovered by the late Gene Shoemaker (for whom the comet Shoemaker-Levy 9 was named) in the sandstone layers around the central mound has convinced most geologists that it is an astrobleme, or "star wound." Shattercones form when impact forces are transmitted through the rocks, creating conical shapes of varying size that have v-shaped grooves cut into them. It is theorized that explosive shock waves punch out shattercones in much the same way that a pellet gun will leave a conical hole in your bay window. Shattercones of enormous size are found in and around a similar circular formation called Vredefort Dome, 100 kilometers southwest of Johannesburg, South Africa. In fact, Vredefort and Upheaval Domes share many similar characteristics. They are both multi-ringed craters with uplifted central peaks. They both display evidence for immense flows of melted rock that contain chunks of unmelted rock within. Both contain "shocked quartz" grains: quartz crystals that are internally fractured, again supposedly due to shock wave transmission. Electric Universe theorists have suggested in the past that electric arcs cut crater walls and transport large volumes of material through electrodynamic forces. Electric currents flowing through the rock strata cause the rock to pulverize, much like a pyroclastic flow from a volcano. Once the current stops, the material consolidates into rock-hard mounds with high, steep faces. Electric arcs cause subsurface blasts, as demonstrated by tachylites found in the rims of both domes. The concentric rings are reminiscent of similar multi-ringed formations discovered in other regions around our planet, as well as on other planets and moons. Perhaps a big rock from space is no more conclusive a theory than a collapsed salt dome. Editor's note: All images courtesy Michael Steinbacher. Visit Michael's web page for more geological images, as well as to see his complete portfolio. Contact Michael Steinbacher to arrange personal tours of the desert Southwest.